Synonyms: Centaurea debeauxii Gren. & Godr., Centaurea x pratensis; Centaurea jacea L. x Centaurea nigra L.
Centaurea jacea ssp. pratensis (=Centaurea debeauxii or C. jacea x C. nigra or C. x pratensis) (meadow knapweed) is a bushy perennial (family Asteraceae) found in a small number of disturbed areas in Siskiyou, Del Norte, and Humboldt Counties in northwestern California. Meadow knapweed reproduces by seed and via shoots from the parent plant, and is known to resprout from root fragments after cultivation. The seeds can also be spread by irrigation systems and vehicles. 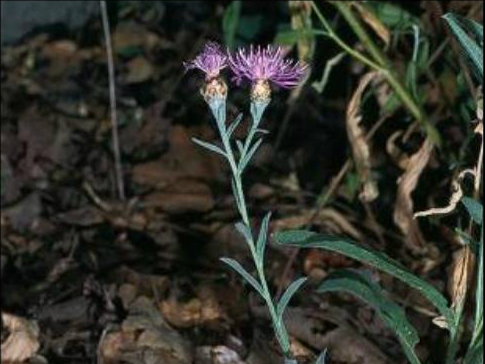 Meadow knapweed spreads very rapidly and is listed as a noxious weed in several western states as well as California.